The holidays are here! It’s time to start piling up the presents under the tree. Holiday shopping can be challenging—especially shopping for the men in your life. This year, we're making it as easy as ever. We've broken down our favourite gifts by type of guys in our lives. This way, you can find something that’s perfect for the special guy in your life. Whether he’s free-spirited or a manly man, we’ve got some gift ideas that any special man in your life will love. Everyone has a manly man in their family. If you’re struggling with what to get him, try adding some functional layers to his wardrobe. The Rugged Man is always outside. In Canada, especially during the insane winters, bundling up is crucial. Giving him a few layers that he can add and remove will keep him at peak working temperatures throughout the day. 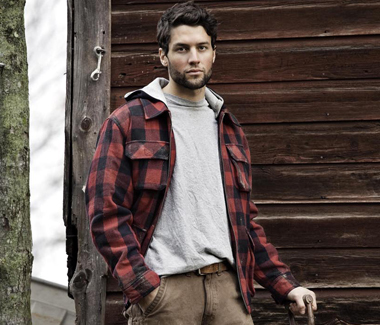 Our all-time favourite for the Rugged Man is our quilted jackets. Crafted with soft brushed flannel and a quilted lining, this stylish and functional jacket will keep him warm all day. Plus, when he’s done working in the yard, he can head to the local coffee shop, bar, or restaurant in style. If you want a few other gift ideas for the Rugged Man in your life, try our quality crafted, Temp-iQ™ Performance Cooling T-Shirts. Made of sturdy cotton, they always look and feel great. Our Duck Jacket is an excellent investment piece that will help your Rugged Man stay warm even in the harshest winter conditions. The Pro is always on the go. No two days on the job are ever the same, but there’s always one thing that’s consistent—his dedication to the craft. The Pro in your life has the experience that make him one of the best. What do you get this type of guy? Our best, and most popular workwear. Year after year, Pros from all over Canada choose our 874 Work Pant and 1574 Work Shirt to tackle whatever the job calls for. These standard base items are crafted from durable and comfortable materials that are designed to give pros the style and protection they crave. 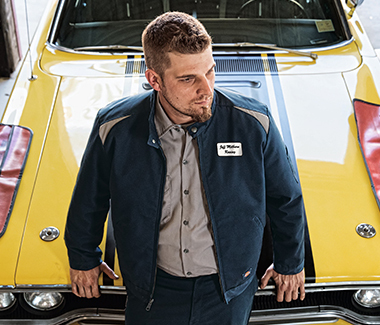 Our workwear is as versatile as The Pro’s resume. It’s really a no-brainer. Music festivals, coffee shops, hot new restaurants—The Casual Guy in your life loves to explore. He can’t be tied down to a nine to five. He’s got one life to live, and he’s determined to live it to the fullest. This type of guy is one of the hardest to shop for, but this holiday season, you can wow him with a few items from our X Series Collection. You can’t go wrong with a light, fitted flannel. In his nomadic lifestyle, The Casual Guy needs items that can be dressed up and dressed down. They crave a minimalist lifestyle with purpose. A flannel provides just that. Dressed up with some dark, slim fit jeans create a casual, yet put together look for all different kinds of occasions. Leave the flannel open with a solid tee underneath for a casual everyday look. A light and new flannel can be thrown in a bag and head off to the next destination with ease. Struggling with what to get The Mechanic in your life? Tools are a safe bet, but you did that last year. And the year before, too. Do something different for the hard working man in your life. Replace his overworn work boots with our state-of-the-art Blaster Work Boot. You can rest assured that his precious toes are safe and protected from the dangerous work at the shop. If he already has a nice pair of boots, try one of our cold weather favourites. During the winter, the cold cement shop can be brutal. Our Insulated Duck Bib Overalls, will help him stay protected and warm all day. Upgrade his coveralls for the shop with our improved Coveralls that will give him the best gift of all—comfort. By improving his work wardrobe this holiday season, he’ll stay comfortable, protected, and efficient, no matter what the day throws his way.